(ii) Should be able to run for a distance 1000 metres in 4 minute and 15 seconds in one chance. (ii) Should be able to run for a distance of 1000 metres in 5 minutes and 40 second in one chance. 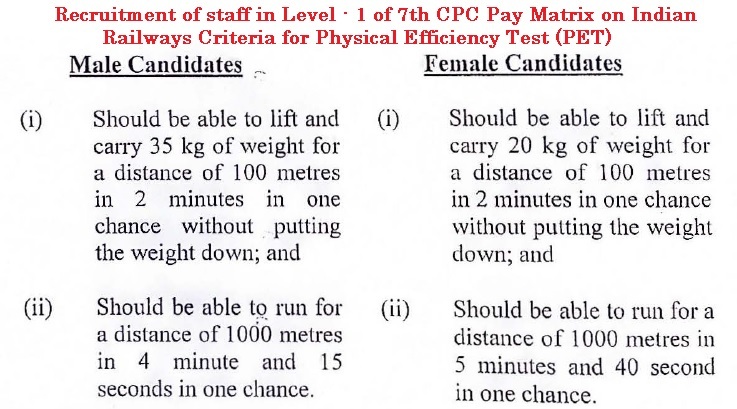 Prescribing criteria for Physical Efficiency Test (PET) for recruitment of staff for all categories in Level - l of 7 CPC Pay Matrix (earlier Grade Pay 1800/-) on Indian Railways.